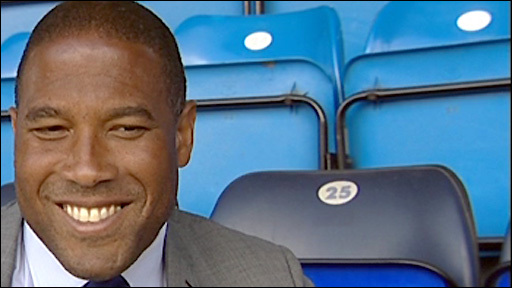 Tranmere have confirmed John Barnes as their new manager, with Jason McAteer named as his assistant. Former England winger Barnes, 45, stepped down from his role as Jamaica coach to take over at Prenton Park following the sacking of Ronnie Moore. "I'm looking forward to it," Barnes told BBC Radio Merseyside. "As long as you have 11 committed players on the field with good organisation and structure we can be competitive [this season]." Barnes previously had an unsuccessful stint in charge of Celtic in 1999/2000 but he hopes his stay at Tranmere will be remembered for the right reasons. And he admits he was very surprised when he found out previous Rovers manager Moore had left the club. "I was [surprised], as Ronnie was just one minute away from the play-offs," said Barnes. "But once the opportunity presented itself, I had no hesitation getting in touch with Peter Johnson, the chairman, and talking to him about my ideas - for the club, for the team and he thought I was the man to take the club forward. "We've now lost a few players and we've lost our captain - I'm looking to get players in. Maybe the budget is going to be smaller than it was, it didn't put me off at all and I would have walked over hot coals to get here." Ex-Republic of Ireland international McAteer, 37, spent two years as player-coach at Tranmere and played alongside Barnes for Liverpool in the 1990s. Barnes started his playing career with Watford and went on to enjoy spells at Liverpool and Newcastle, winning 79 caps for England. He was appointed coach of the Reggae Boys in September last year. McAteer left the club in 2007 after three years as a player and had a coaching spell at Chester in 2008. Chairman Johnson told the club website: "I am delighted John has agreed to become our manager as he was our first choice for the position. "With John and Jason as the club's management team they bring a wealth of experience, knowledge and contacts within the game. "They are a Wirral-based partnership who are very enthusiastic about what they can offer Tranmere and I look forward to watching their team play next season. "They have both had successful careers as players and hopefully they can be successful together in management at Tranmere." A statement from Jamaican Football Federation read: "His contract was due to expire on June 30, 2009. "Barnes secured a contract with Tranmere for the upcoming season and advised the JFF of that development. "With Barnes securing a job prior to the Gold Cup, the JFF decided in the long-term interest of the game not to offer him a short-term extension, but to appoint Theodore Whitmore as national coach for the remainder of the life of this administration."